While major crime continues to dwindle across the United States, vehicle theft will always be a crime of opportunity. 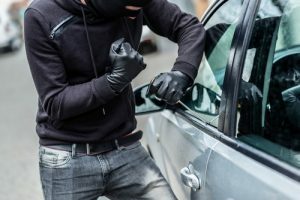 In 2014, there were an estimated 8.3 million property crimes in the U.S., and vehicle thefts accounted for 8.3 percent of those incidences, according to the FBI. As a car owner, you can take precautions to prevent your vehicle from being stolen. Here are some important factors to consider:. You can turn these simple practices into everyday habits to keep you car safe. Whether you’re driving or just stopping into the grocery store, be sure to always keep your car locked. In addition, when parked, never leave your keys inside the car, and remember to close all your windows, including your sunroof if your car has one. When it comes to parking, if you’re parking on a hill or incline, be sure to turn you car’s wheels into the curb. Believe it or not, some thieves actually tow cars away from their parking spot. But by turning your wheels into the curb, you can make it harder for a thief to get away with your car. Far too often, thieves get away with their crimes due to the owner not taking the proper precautions. Bottom line: Don’t leave important information in easy-to-find places inside your car. Instead of leaving your car’s title in the glove box, keep it in your home, or if multiple people use the car, consider hiding it in a location that only the drivers know about. This way, if a thief is pulled over behind the wheel of your car, they won’t be able to produce these important documents, which will arouse suspicion from the police. In addition, you should have your car’s VIN etched into each window. If a thief gets away with your car, they won’t get off cheap, as they’ll have to replace all of the glass to go undetected. Thieves aren’t. Criminals actually prefer to work at night. During nighttime hours, be cautious of where you park your car, and try to do so in a well-lit area. In addition, look around and always be aware of your surroundings, including gas stations, parking garages and lots. Remember, if you’re confronted by a carjacker, whether during the daytime or at night, do not resist. Your car can eventually be replaced, but you can’t. A recent study conducted by the Urban Institute returned mixed results about security cameras effectiveness when it comes to preventing crime. The study, which analyzed crime in cities like Washington D.C., Baltimore and Chicago, found that security cameras were effective in some areas, but not all. Yet, most experts recommend the use of security cameras to keep not only cities safe, but also your home, belongings and vehicle. A high-tech security monitoring system with high-definition cameras, including models available from Lorex Technology, can be effective in keeping your car safe. Some styles even offer mobile connectivity, so you can keep an eye on your assets even when you’re not around.